Paul and Jamie are driving me back down to Richmond. Also fitting in a visit to a friend with a meadery in town. They’ve some European meads to give him. We’re a little late setting off. We had meant to be on the road by ten. It’s closer to eleven by the time we’re on the motorway. The roads are very busy. Where the hell is everyone going? Why are they all going out of town? Probably some outlet mall is their destination, according to Jamie. I spot a huge Confederate flag adjacent to the motorway. Lovely. 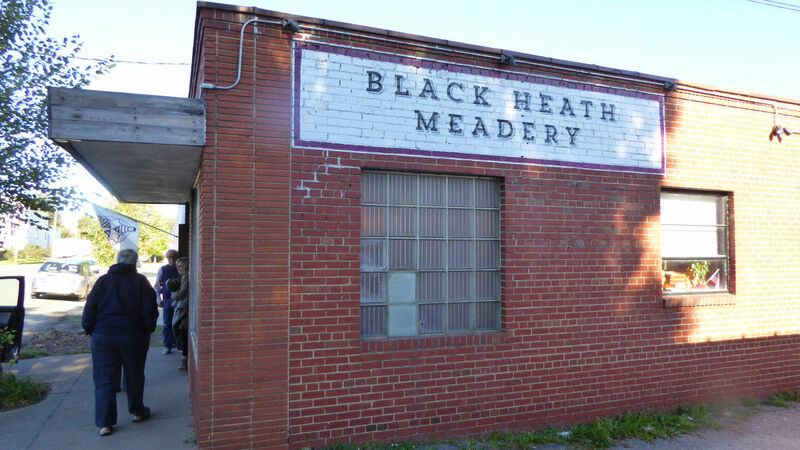 We roll up at the Black Heath Meadery. To find that their friend, Bill Cavender, has popped out. We decide to take the opportunity to have lunch. Jamie asks the barman what he would recommend that’s close by. “Lunch or Supper.” He suggests. Well, lunch obviously. What a strange thing to say “It’s just one and a half blocks away.” Ah, Lunch or Supper is the name of the place. That’s confusing. At least it’s dead close. 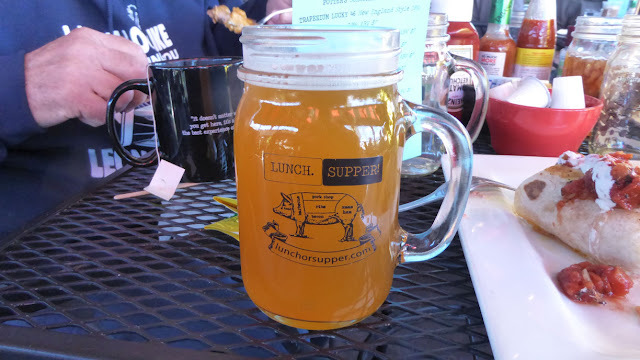 It’s a sort of barbecue, southern cooking sort of place. It looks quite full. One of the staff tells us that it’s a 20-minute wait if we want to eat inside. While we can be seated outside immediately. We opt for that. Once we sit down we realise that it’s colder than it looks. Out of the sun and in the wind, it’s quite chilly. Even with the outdoor heaters. I’m not wearing my coat, stupidly. But I’m from the North. I’m going to grin and bear it. Fried chicken and waffles seems a popular choice. It looks really weird, being topped with breakfast gravy, that strange white sauce stuff they have in the South. It seems an odd combination with waffles. I manage to resist that and order instead a rather modest pulled pork wrap. With hash browns. They have a reasonable beer selection. I go for a Trapezium Lucky 46, a New England IPA. It’s fine. If you like that sort of thing. Sadly it’s served in a stupid jar thing with a screw thread. Really crap for drinking from. Why on earth do places use such crap glassware? Paul and Jamie, perhaps wisely, both order tea. Though Jamie’s mint tea turns out to be iced. Not so great, given the temperature. When we get back to Black Heath, Bill still isn’t there. Though he does breeze in through the back door a couple of minutes later. 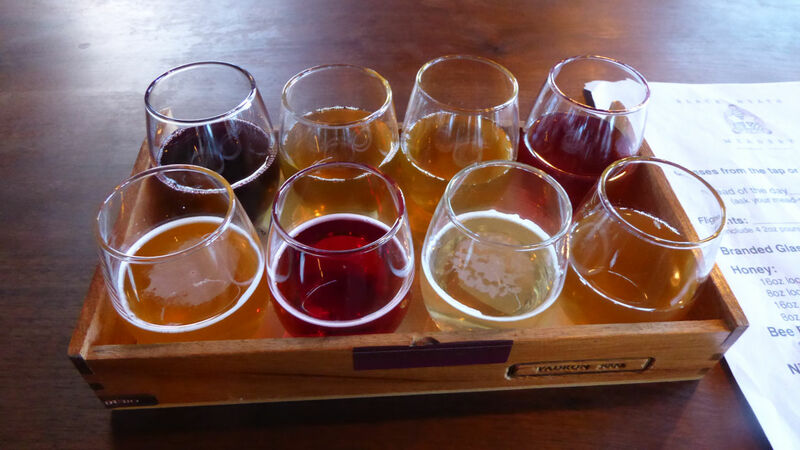 We’ve already got ourselves a sampler tray of meads, eight in all. A couple are traditional, that is just made from honey and water. The others are flavoured. I quite like the ginger and raspberry ones. Silk Road, with eastern spices, is oddly savoury. Not quite sure what to make of that. “He’s an old hippy.” Is how Jamie described Bill. He certainly looks the part, with his tie-dye T-shirt, headband and long, grey hair. He’s a fun bloke and very enthusiastic about mead. Which I guess is handy if you own a meadery. Time is getting on and Paul and Jamie need to get back to Washington. If the traffic is anything like as bad as on the way down, it may take them a while. It’s about 6 PM when they drop me off at my hotel downtown and we say our goodbyes. After checking in there’s just one thought on my mind: beer. Not being in arsing mood, I decide to try the Irish pub I didn’t quite make it to when I was in Richmond a few days ago. It’s not far. Inside, it’s fairly big and much like any other Irish pub. Not very busy. Just a few punters at the bar watching American football and the odd table of diners. I squeeze my gut between barstool and bar, then survey the beer options. An Oatmeal Porter looks the most interesting, so I order that. With a side of Jack Daniels. Half way through the beer I get a bit peckish. I don’t want anything too big. That crab cake sandwich should do. The two blokes to my left are dead into the football game. The Washington Redskins are leading by three points, but their opponents have a field goal attempt with seconds to go. It hits the post and bounces out. Then it becomes obvious why they’ve been watching so attentively: they both have quite a bit of money on the Redskins. After a couple of drinks, I wander back the short way to my hotel. Which is a rather nice one. I lounge around in my room. Watching something on TV for a while. Until sleep slides surreptitiously under the door. Has there ever been a serious market in the UK for mead, at least since the days of the Viking invasions?